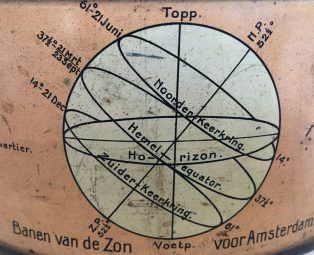 Rare Dutch student terrestrial globe from about 1912 is set within a painted tin meridian circle graduated in four quadrants, contained in a tin drum-shaped table stand, the painted horizon showing degrees, days of the month, the houses of the zodiac, and compass directions. 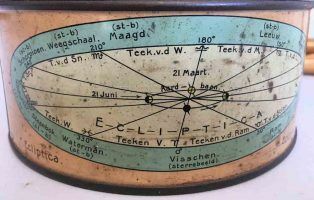 The outside of the drum is painted with astronomical diagrams of eclipses of the sun and moon, the ecliptic, the equatorial co-ordinate system used for mapping celestial objects, and the path of the sun in relation to Amsterdam. 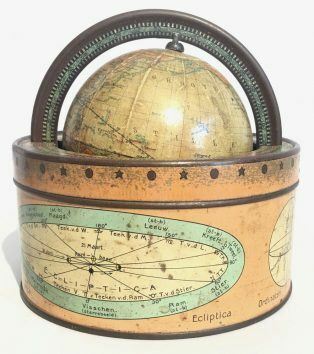 The globe is comprised of twelve gores and two polar calottes, the equatorial and Greenwich meridian graduated in degrees, the ecliptic graduated in degrees 0-360 with signs for the houses of the zodiac, the continents variously and brightly colored. Place names are in Dutch. 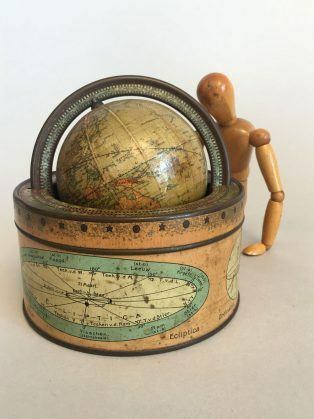 This globe was created as an educational device for Dutch students to study geography and astronomy. It is credited in the cartouche to C.L. 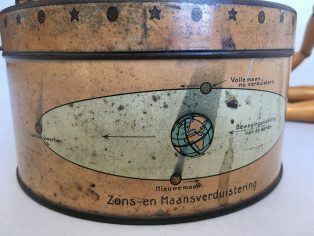 van Balen, who wrote textbooks on mathematics and geography and edited the main Dutch school atlas in use for decades during the first half of the 20th century. 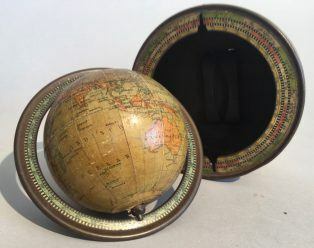 The globe and school atlas were published by J.B. Wolters.